I'm doing some home improvement, and have the necessary skills, tools, etc, for the job. There is one thing I'm lacking: a large pickup truck for transporting lumber. A buddy of mine used to have one, but he had to trade it in for an SUV to get the kids to/from school, sports, etc. A 5/8" thick x 4' wide x 8' long MDF particle board. 16 2x4's, each at 6' long. I think I'll have to do two trips. 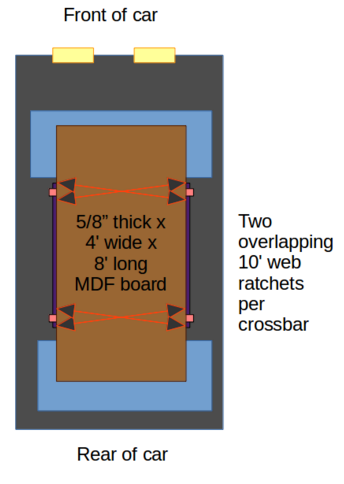 The planned setup is documented below (pardon the obscene number of pictures), and I plan to essentially run web ratchet straps (with band protectors where it comes in contact with the wood) to hold down the load to the cross-bars, and then an extra 20' web ratchet strap along the length of the load to act as a fail-safe. I'll have to drive maybe 20 minutes at highway speeds, and am concerned, especially in the case of the MDF board, of the payload catching too much wind drag and being pulled off the roof (ie: acting as a big parachute). Does the setup below look sound? 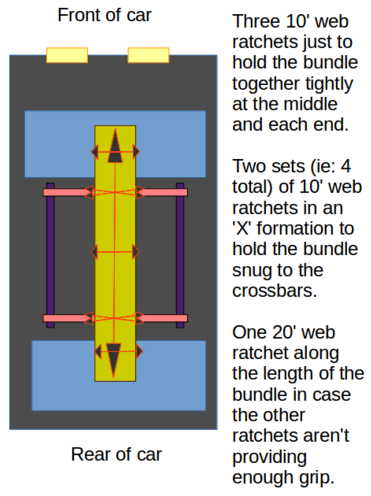 I'm not comfortable enough with my knot-tying skills to go with a hitch in place of the web ratchets, unless there are some dead easy knots I could use in place of the ratchets. I do not want to pose any risk at all to other drivers, so if I need to invest in additional hardware to secure the lumber, that's fine with me. Also, if I can find a working approach for the lumber project above, I also need to transport a glass door plus frame about 400km at highway speeds, and was wondering if it would be viable to fix it down to a large piece of plywood similar to what I'm doing above. I'm getting a pair of stainless steel tow hooks installed on my vehicle tomorrow. The current little hook on the rear of my vehicle doesn't have a large opening, and the one on the front is a joke, as it just screws on, so it's easy to steal. The new ones will be bolted on the vehicle without the bolts being exposed. 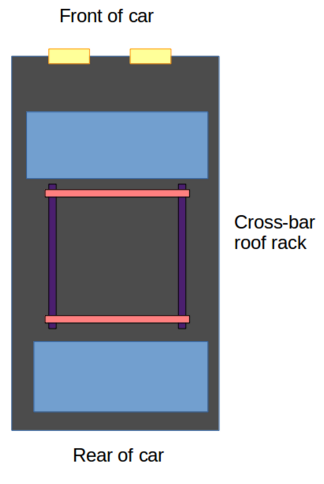 I'll continue using my roof rack with the advised ratchet configuration to secure them (ie: the pen-and-paper plus elastic example in the accepted answer), and using a large 27' ratchet wrapped around the length of the load, and secured to the rear and front tow hooks (with thick protectors where it touches the car chassis) to keep the front of the planks from flapping upwards and either snapping off or acting as a parachute. Plus, it gives some extra security in case the friction from the other ratchets isn't enough. Thanks everyone! This approach will clamp a low, flat load very securely in place. With the straps snug you shouldn't be able to budge it at all. Nevertheless, stop to inspect the load carefully after five minutes and regularly thereafter, and you're right to worry about the parachute effect. If you're not comfortable with what the load is doing on the highway, hit the hazards and slow down. If people can't pass, pull over every few minutes. That ought to work for the door too, but a glass door be a lot heavier than the MDF, and assuming the edges are plastic or aluminum or finished wood, it'll likely be smoother (i.e. less friction against the straps). Finally, it's a much longer drive. So I'd want at least one strap securing the front of the door to something under your front bumper, for insurance against sliding back under acceleration. And then another to the rear, to guard against hard braking. I can't say for sure how you would secure those end straps without seeing the door. If the door is mounted in a frame, you could loop them around the lintel and sill parts of the frame. To avoid contact between the hook and the frame, tie a figure-8 loop in the strap two feet from the hook, run the hook end through the door frame, and hook it onto the loop. You may need a pair of extra long straps for that part. You'll need to keep the strap under tension for this to be secure, and remember that the rear one may be out of view so you'll have to get out and inspect it regularly. Also if the rear end of the door overhangs the rear bumper, as it probably will, then the rear strap can't resist forward movement except in a disaster where the whole door comes completely free. Then you're just hoping to slow it down a bit. 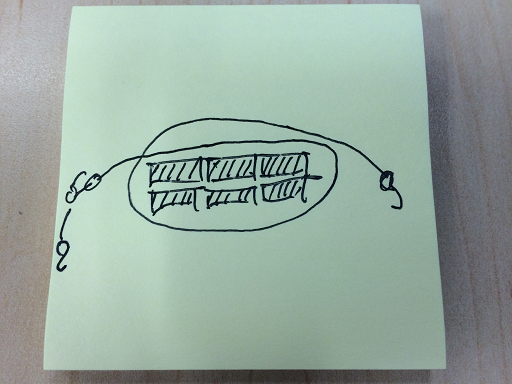 So if a forward movement will slacken both end straps, you must keep a close watch on the front strap for slackening. 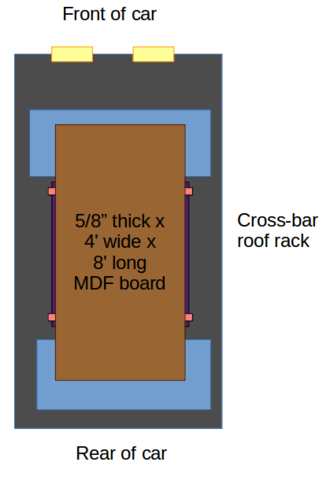 And here's how I'd put a strap around a bundle of 2x4s on top of the MDF. The loop clamps them together and also grabs them to prevent sliding back. 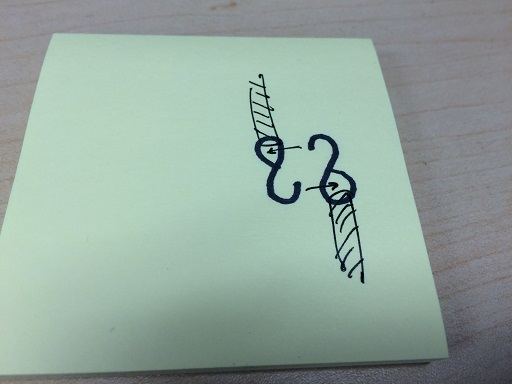 Note that the loop is arranged so the strap crosses at the top, not the bottom. That method would work with sheet goods as well. I would also consider renting a U-Haul 5x8 utility trailer for the door. Using a trailer for the lumber also would be safer, much easier, just as secure, not much more expensive, but infinitely less fun. I hear there are some weird people who don't think securing large things with ratchet straps is fun. But that's just weird. Almost all of the Home Depots that I do business with have short term rental trucks available right in their parking lots for very reasonable rates. Call in and reserve one for a particular time. Drive to the Home Depot in your car and park it in the lot. Go inside and checkout the truck. Then drive it up and load all of your materials and head home with it to unload. Take back the truck, check in and head away in your own car. This is a lot safer option than risking some accident resulting from wood items sliding or flying off the roof of your vehicle. I think you're overthinking this. I carry all kinds of lumber on my roof rack all the time. The 2x4s are no problem at all. Just strap them down tight, one at the front bar and one at the back bar. Sheets goods are harder. Your drawing is completely not to scale and I think you will be surprised how big 4x8 is when you get it up there. 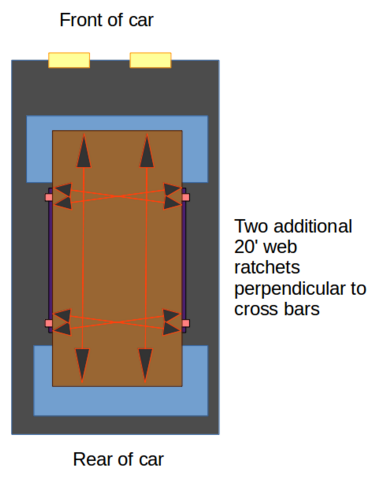 However as long as your bars are wider than 4 ft it again won't be a problem. I would do it all in one trip. 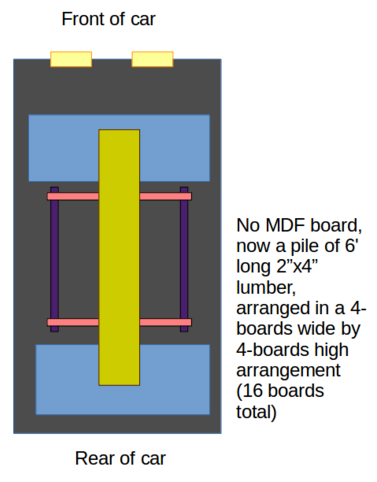 In fact the 2x4s will help keep the MDF from flopping around. 2 or 3 straps should be enough. The MDF might be a problem. When driving at any appreciable speed the sheet will catch air and try to sail up and away. This is compounded by the air that is pushed up and over your hood and windshield, right up into the MDF. Use the 2x4's on top of the MDF for support. Try to shift the whole sheet farther back than you normally would. This will reduce the overhang over your hood. 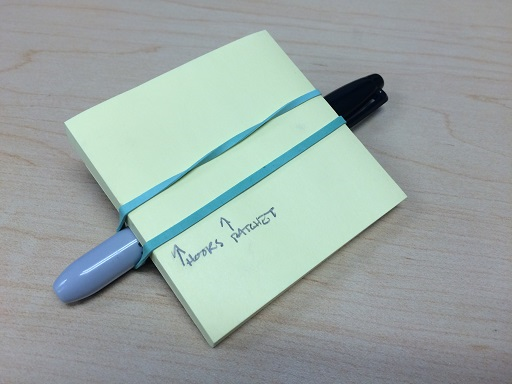 Try to tie it on in a way that holds the front edge of the sheet down. Don't let it start to lift up. Not the answer you're looking for? Browse other questions tagged safety construction security lumber rope-knots or ask your own question. What internet-connected home security system options exist? What is the safe/correct way to work on gutters? From a ladder or from the roof? What is the proper, safe, and effective way to apply diatomaceous earth? Should I let pressure treated lumber dry before building with it? Is it safe to put pots and pans with hard plastic handles on the bottom rack of the dishwasher?